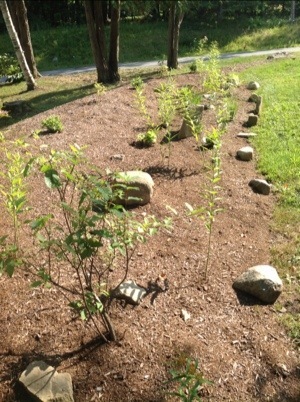 This past May I collaborated with some local contractors on a large rain garden project in Lake George, NY. This week we returned to take some photos of the rain gardens progress. Shown above is the rain garden that we manipulated to behave as a wetland habitat; this piece of the property has standing water during much of the spring. All the plant species here are native and tolerant of both, standing water and drought conditions. A side bonus in gardening with native plants is the creation of habitat. 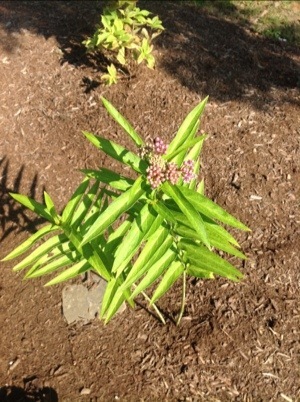 This photo illustrates Swamp Milkweed (Asclepias incarnata) which is the necessary plant for Monarch butterflies habitat, thus making it an important inclusion in the habitat garden. This garden is a utilitarian grass catchment base style rain garden. It is located in between two roofs where rain runs off. 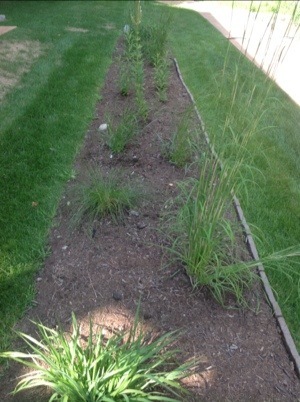 The grasses are all native species, most notably Big Bluestem (Andropogon gerardii) and Little Bluestem (Schizachyrium scoparium). 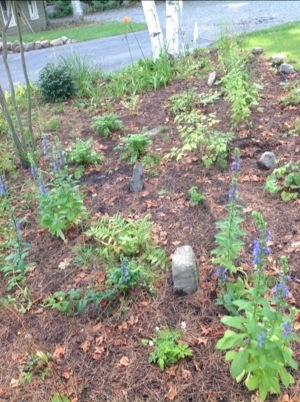 Here is the sunny, sloped rain garden. It is large and this photo is a cross section of the whole. Prairie native plants are used, over years the plants will flush out and the roots will hold the soil in place, preventing erosion on the slope. 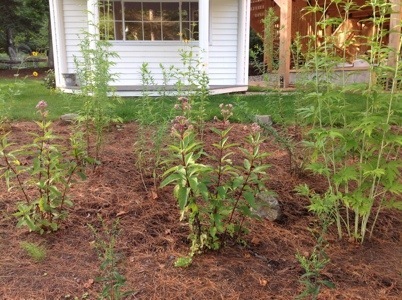 Joe Pye Weed (Eupatorium maculatum) is at the forefront here; another stellar plant for the habitat garden. This is the shady rain garden, also built on a slope for erosion prevention. Blue Lobelia (Lobelia siphilitica) is in bloom here. The Lake George Association offers lots of helpful information and suggestions about rain gardens and some excellent native plant choices.